So the Yellow Box was created in 1999 as a custom one-off solution for this specific problem. correction - so the speedo WORKS." 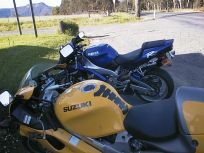 Other TLR, 'Busa and Suzuki owners wanted one for their bike - and the Yellow Box version 1 was born. new must-have product on everyone's aftermarket wish list. And the worldwide phenomenon began. With the popularity of the original Yellow Box for Suzuki motorcycles, owners of other bikes wanted one too. popular motorcycles. Many Honda sportscars also came to rely on the Yellow Box for speedo calibration. speedo corrector. Software upgrades included an intuitive, easy-to-use speedometer correction system. utes, being especially popular for speedo correction on Toyota vehicles. was also added to provide MPH conversion for imported KPH vehicles. After seven years of producing the world's premier speedometer recalibrator it was time for a facelift. features. Now taking shape in a custom styled, super-compact design making the YB4 smaller and lighter. Trusted performance with a 10-year full replacement warranty! lives up to our reputation for superb reliability. To all our customers over the past 13 years, for your ongoing support and your trust in our services. You have helped to make the Yellow Box Speedo Recalibrator what it is today! All of us here at YellR wish you safe riding and driving! "With the confidence that comes from knowing exactly how fast you are going." Enjoy.